Thousands of fans mourned James Brown’s death in 2006. The iconic “Godfather of Soul” championed a musical career that spanned six decades and traversed genres of gospel, R&B, and of course, funk. But as 10,000 fans approached his lifeless body during the December 28th public viewing, a close friend, Al Sharpton, was especially devastated. 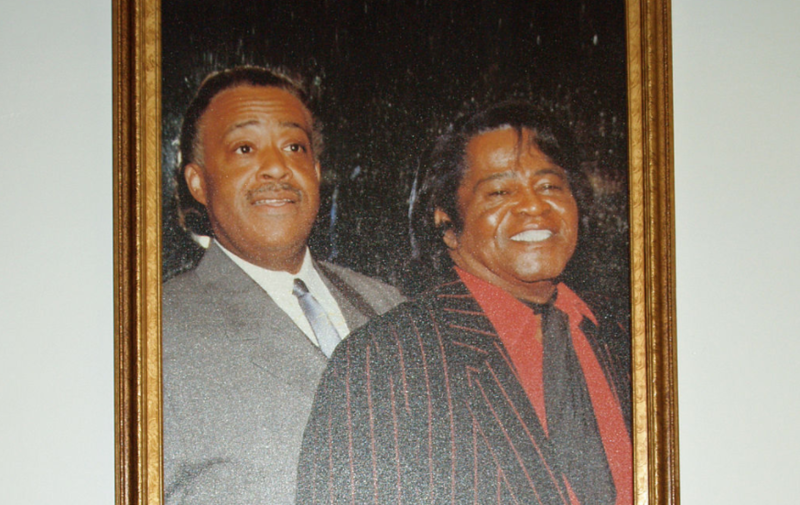 Not many people know that Al Sharpton, President of the National Action Network and MSNBC host was close friends with James Brown – both on and off camera. The friendship of a reverend and rockstar may seem unlikely to some, but here is snippet into their father-son dynamics. There are conflicting reports with just how Mr. Sharpton and Mr. Brown first became acquainted. A 2006 report insists that the two were backstage and Sharpton was “so entranced by [Mr. Brown’s performance] that he accidentally followed him on stage.” Another account insists they met in 1973 following the death of Brown’s son, Teddy. Teddy was a part of Sharpton’s youth outreach organization at the time of his death by car accident. In response, Brown performed at a memorial concert and donated the proceeds to Sharpton’s organization. From this, Brown and Sharpton then developed a mentor-mentee or father-son relationship, “with Sharpton adopting Brown’s hairdo, his flamboyant style and even aspects of his radical politics.” Sharpton even joined Brown for some of his tours, traveling by bus through destinations and spending time with the famous singer when he wasn’t onstage. Though Sharpton was a part of Brown’s extended family, he still referred to James Brown as “Mr. Brown.” This was customary, however, since Brown insisted that everyone around him address each other using formal titles. The two exchanged career and family advice, with Sharpton even stepping in as mediator between disputes between Brown and his wife. Brown, in return, gave Sharpton advice on how to promote for his new organization, National Youth Movement, and even introduced Sharpton to his wife (who was a backup singer from Brown at the time of meeting). Eventually, Sharpton would use his advocacy to protest Brown’s criminal proceeding including organizing a press conference and participating in a protest. Prison wardens would allow Sharpton to visit Brown in prison, even when the family was not permitted. Brown and Sharpton’s bond is a reminder of the father-son, mentor-mentee, and brother-to-brother relationships that are so important to our community. Though they may have been an unlikely pair to some, their strengths complemented one another and their bond was unshatterable. Rest in Power, James Brown.